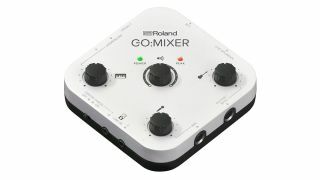 The What: Roland is now shipping the GO:MIXER, a compact audio mixer for smartphone video production. Compatible with iOS and Android smartphones, GO:MIXER connects digitally via an included cable, providing stereo sound that’s a marked upgrade over using the phone’s built-in mono mic or analog line input. The What Else: Offering plug-and-play convenience, GO:MIXER is ready to use out of the box. Powered by the smartphone connection, it requires no batteries, and with a compact size of 3.75 inches (95 mm) square and 1.1 inches (28 mm) tall, GO:MIXER is perfect for desktop and mobile use. GO:MIXER supports connecting up to five sources at once via inputs for a vocal mic, guitar/bass, stereo keyboard, and two stereo line-level devices (such as music players, drum machines, etc.). Front-panel knobs provide hands-on mixing for the mic and instruments. There’s also a stereo output jack for monitoring the sound via headphones or an external amplification system, plus a dedicated panel knob for adjusting the monitor level. One of GO:MIXER’s line-level inputs offers a selectable Center Cancel function, which reduces the volume of the main vocal in a music track that’s playing through the input. This is a great feature for singers, allowing them to create karaoke-style tracks on the fly. The Bottom Line: With multiple inputs available, users can connect a mic, musical instruments, and media players, and mix them all together live while they shoot. Ultra-portable and simple to use, GO:MIXER is the ideal solution for adding a pro sound touch to social media videos.